One of the most interesting trends currently in the Earth Observation (EO) market is satellite constellations. Insight-hungry end-users are demanding more data, more often, and look to current and upcoming fleets of satellites to provide it. Investment and launch availability continue to grow, with constellations under development for satellites both big and small. However, another form of satellite constellation has been, perhaps more quietly, developed which presents a low CAPEX counter to launching fleets of hardware: the virtual constellation. Partnerships formed in the industry are enabling satellite operators to expand their product portfolio, and fill their revisit, resolution, and coverage gaps without “real” assets. The PanGeo Alliance is the best-known example, featuring 7 operators sharing the resources of 13 operational satellites and archived imagery. Customers gain access to a wider portfolio of data, and increased revisit opportunities, than would be possible by working with a single supplier in the fleet. Urthecast is a case in point as in the last 4 months it has signed distribution deals with e-Geos, SIIS, and Beijing Space View, alongside their participation in the PanGEO Alliance. 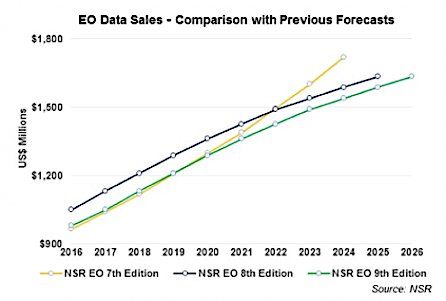 NSR’s Satellite-based Earth Observation, 9th Edition forecasts the global sale of satellite imagery to reach $1.6 billion by 2026, with a lower CAGR than last year’s forecast. Many factors contribute to this decrease, including a depreciation of imagery prices via increasing supply, and an industry-wide move of value away from imagery toward insights and analytics. While lower prices and improved revisit rates from launched constellations are expected to increase the adoption of satellite imagery, oversupply and competition are expected to continue the slow decline of global data revenues marked in recent years. Data distribution deals can allow a supplier to remain focused on their specific value proposition, while expanding their in-house analytics capabilities, global reach to customers, and diversification of product lines. Virtual constellations may also offset the depreciation of satellite imagery, by keeping tighter global control of market supply. In a way, the uptick of consolidations seen in this industry also attests to this, with MDA gaining over 45% of global satellite-based EO market share without launching additional infrastructure through their acquisition of DigitalGlobe. On paper, virtual constellations make better business sense than raising capital for building and launching fleets of satellites. However, in practice, data distribution partnerships appear to be more of a means to an end; a manner of generating revenue while a company works toward their main goals. For BlackSky, revenues from their virtual constellation likely aided in the development of their analytics platform, which has recently gained confidence with the U.S. Air Force. For Urthecast, these partnerships are aimed to offset a 74% decline in EO revenues, steadying the company as it pursues their SAR and optical satellite constellations. Despite the CAPEX required, most imagery suppliers are pursuing the launch of their own constellations to benefit from increased control over fleet operations and distribution of their products. Additionally, new satellites are expected to bring market innovation through improved technology and services, thereby expanding the market. However, virtual constellations should not be discounted, as they provide a low-risk means of expanding a supplier’s global reach and market capabilities. More than a temporary solution, virtual constellations pique potential customer interest, open distribution channels, and should complement investment in launching one’s own assets. End-users are most interested not just in the supply of data, but in the price, platform, cadence and any added value that operators can provide. The growing variety of customers’ needs and supplier competition warrants a strategy involving multiple revenue streams and diverse product offerings.